In this superb history, two seasoned journalists unfold the decisive campaigns of the desert war that began with the Italian invasion of Egypt in September 1940 and ended with the mass surrender of Axis forces in Tunis in May 1943. Writing with great verve and style, John Bierman and Colin Smith create a stunning panorama peopled by some of the most glamorous, dangerous and mysterious figures in the war. 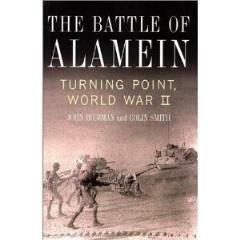 At the center of this sweeping narrative stand two heroes, German Field Marshal Erwin Rommel, the notorious "Desert Fox," and the British Lieutenant General Bernard "Monty" Montgomery, whose showdown at the little Egyptian railway stop of El Alamein is one of the great moments in military history. Bierman and Smith have interviewed scores of survivors and tracked down hitherto overlooked primary sources to craft a historic narrative that reads like a novel. Here too is the remarkable true story of the shadowy Hungarian adventurer Laszlo Almasy, the prototype for the romantic English patient of Michael Ondaatje's novel. Triumphant tactical warfare, an exotic backdrop, wrenching personal conflicts both inside and between the armies-The Battle of Alamein has it all. This is military history at its absolute best.